Dimitri Tsykalov is a Paris-based Russian artist. In 2003, he participated in the Artists’ Residency Programme at IMMA. 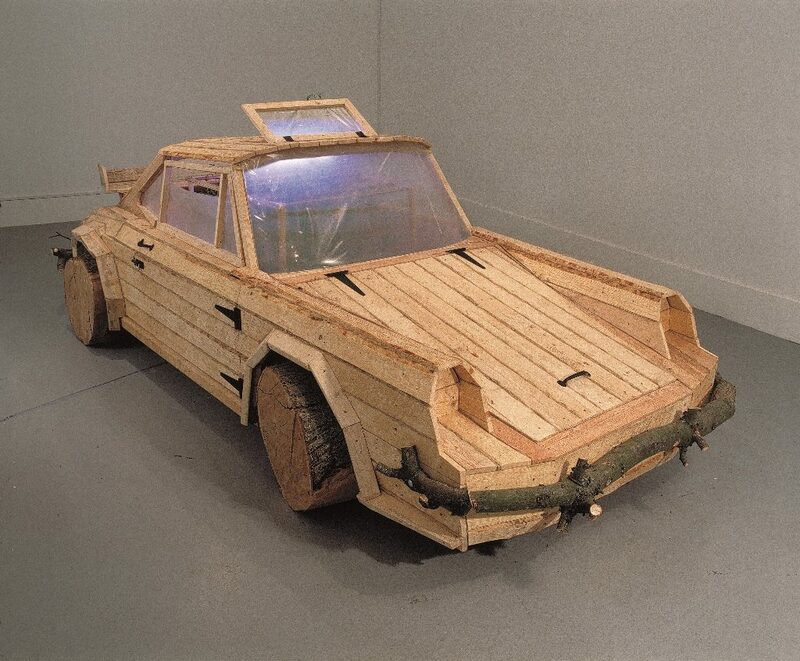 During that time, he collected scrap wood from skips around the grounds of the Museum to build a fictional wooden sports car in the shape of a Porsche 911. Trees felled in the Phoenix Park became the wheels and bumper of this static speed machine. When first shown at IMMA in September 2003, the car was ‘Shed’. Tomato plants were cultivated under a grow-lamp inside, eventually poking their way out through the sun-roof. A gardener’s tools and tricks of the trade were stored under the bonnet, complete with a bottle of whiskey and wellingtons. As ‘Chalet’, the function of the iconic sports car is again disregarded. ‘Chalet’ is a dwelling in a fictional sports car for two characters who have surrounded themselves with creature comforts and everyday objects. The kitchen, which is located in the boot, provides their fuel. Their clothing and toiletries are stacked neatly under the bonnet. A potted plant grows in the back seat. The various functions of the car derive from Tsykalov’s folk memory of the many after-lives given to such technical wonders when modern technology fails. The references to traditional craftsmanship are a reminder of the alternatives.